FACILITATE your video capture over USB 3.0 for two cameras and with versatile I/Os. Works with vMix, Wirecast, Panopto etc. and all apps supporting two or more video input devices. Easy, No Drivers, No Setup ! Compatible with all Apps ! Simultaneous capture of two uncompressed HD video streams into one single USB 3.0 link. HDMI, DVI, VGA or CVBS video input connectors. 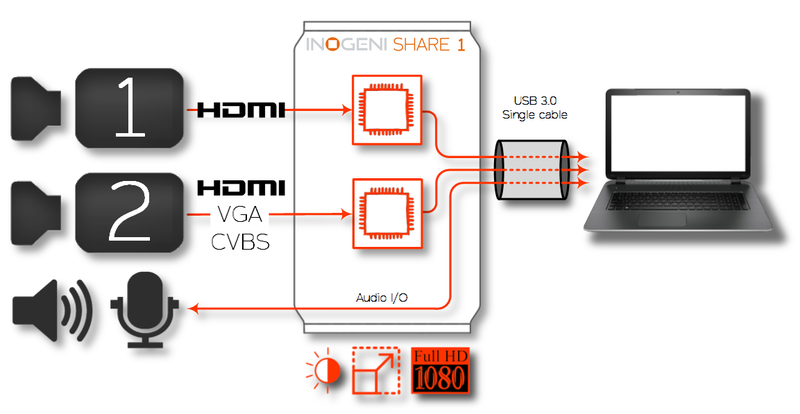 If you want to create your own video mixing, you can use the SHARE 1 which offers to the user two video interfaces. The vMix® and Wirecast® applications can manage two video sources simultaneously like shown below. 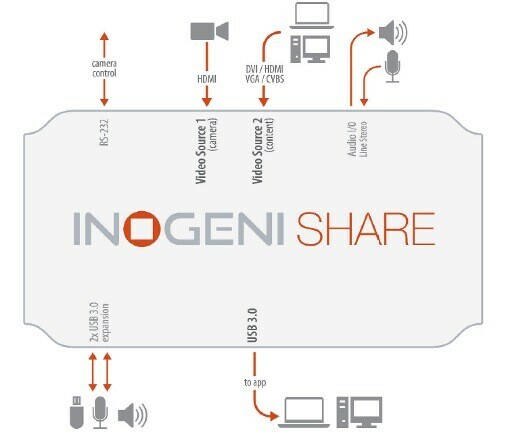 The two video interfaces will show up as "INOGENI Camera" and "INOGENI Content". Dual Video to USB 3.0 Multi I/O Capture. 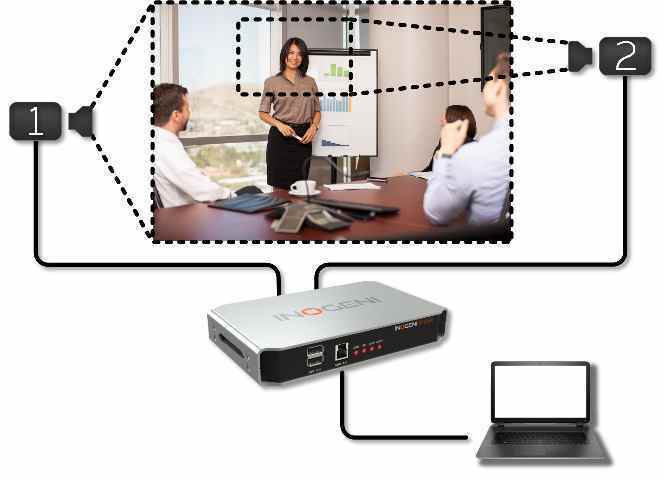 FACILITATE your video capture over USB 3.0 for two cameras and with versatile I/Os. Works with vMix, Wirecast, Panopto etc.and all apps supporting two or more video input devices. 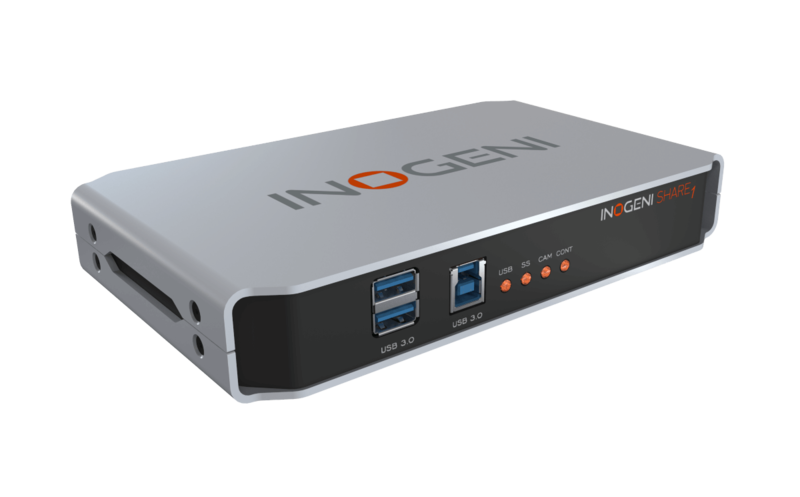 Simultaneous capture and mix of 1x HDMI and 1xDVI/VGA/Component Analog or digital/or CVBS + Audio into 1x1080P60 USB3 signal. Simultaneous capture and mix of 2x USB2 signals + Audio into one 1080P60 USB3 signal. HDMI Note: You may use a HDMI to DVI adapter and have two HDMI inputs. 2-channel LPCM 48kHz audio from line input or embedded in HDMI. 2-channel LPCM 48kHz audio from line input or embedded in HDMI or USB. The device will not decrypt BD/DVD movies, satellite/cable receivers or other encrypted sources. RS-232 port on RJ-45 connector for RS-232 or VISCA control. Requires installation of COM port driver. See Support tab. RS-232 on terminal block for VISCA control. Two (2) extra USB 3.0 ports for expansion purposes. The devices connected will appear to the host. Input 1 at 1080p50 and Input 2 at 1080p30. Both Inputs at HD resolutions, such as 1080i60, 1080p30 or 720p60. Input 1 at 1080p60 and Input 2 at 1080p23. All other combinations at lower resolution or frame rate. The internal scaler can be used to reduce the resolution and frame rate of the input if necessary No USB Bandwidth limitation. UVC-compliant. Runs with all software compatible to DirectShow, AV Foundation and V4L2.UVC-compliant. Runs with all software compatible to DirectShow, AVFoundation and V4L2.UVC-compliant. Runs with all software compatible to DirectShow, AVFoundation and V4L2. Power supply, USB 3.0 cable, HDMI-to-DVI adapter, VGA-to-DVI adapter, serial RS-232 cable. Power supply, USB 3.0 cable, RS-232 terminal bock adapter.